INTENSITY: 3 to 8 for most experiences. Peyote and San Pedro are New World psychedelics. In ancient times their use was concentrated in the regions to which they are native. 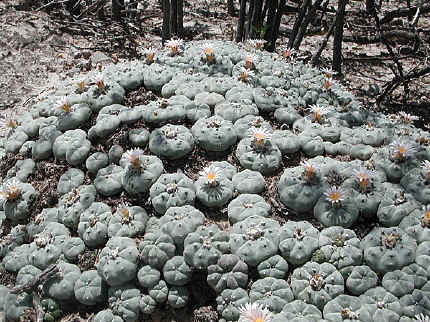 Peyote was used throughout Mexico to as far north as Texas, San Pedro in the Andes mountain region of South America. The earliest known depiction of San Pedro cactus is on a stone tablet found in Peru dating to 1300 B.C. Ritual objects containing images of Peyote have been found dating back to 500 B.C. The introduction of Peyote into the U.S. and Canada, and its use by North American Indian tribes, occurred much more recently, beginning sometime in the late 1800s. As with mushrooms, the Roman Catholic church tried to abolish the use of Peyote and San Pedro. However, they were only partially successful. Peyote use spread from Mexico to North America, and the Native American Church was formed in 1918 to preserve Native Americans' right to use Peyote. And with San Pedro, the ceremony practiced by many South American shamans continued while incorporating several Christian symbols into the rituals. The name of a Christian saint was even adopted for the cactus. Mescaline was the first psychedelic compound to be extracted and isolated, which occurred in 1896. In 1919 it became the first psychedelic to be synthesized. For the next 35 years it remained a somewhat obscure compound known primarily to the psychiatric community. In 1953 the popular novelist Aldous Huxley read about mescaline. Soon thereafter Huxley tried mescaline, and brought it to the attention of the public by writing The Doors of Perception. Today, natives throughout North America still perform sacred Peyote rituals. In South America shamans continue to hold traditional San Pedro ceremonies which are associated with healing, imparting or counteracting witchcraft, and putting one in touch with supernatural and divinatory powers. A claim frequently heard about the San Pedro experience is that the user embarks on a flight of a telepathic nature being transported across time and space. A user who embarks on this "astral journey" may perceive events happening in distant parts of the world, or in metaphysical realms. This flight phenomenon, which I have not encountered in my experience with San Pedro, may result from solanaceous plants which are frequently included in the San Pedro brew and contain the Belladonna alkaloids. In the U.S. Peyote is illegal for all but members of the Native American Church, and it is seldom seen in the psychedelic underground. Apparently there is even becoming a shortage for the Native American population, since the cactus grows at a very slow rate. A typical 2" diameter Peyote button may require 20 years to reach that size, and it has been harvested much faster than it can grow for many years. Synthetic or pure crystalline mescaline is one of the rarest psychedelics, and misrepresentation of other substances as being mescaline is very common. I've only come across true synthetic mescaline once in my life, but have seen items ranging from LSD to DOB (a relative of 2C-B) being sold as mescaline several times. Illegal drug labs rarely produce mescaline for the underground market because of its inefficiency, high cost, and lack of a market. It requires approximately 1/2 gram of mescaline sulfate to produce a psychedelic trip. This same amount of material would represent 4 doses of ecstasy, 20 doses of 2C-B, 50 doses of psilocin, or 2500 doses of LSD. And without the large market of substances like ecstasy, smaller, less efficient batches must be produced, raising the cost of production even higher. The small amount of mescaline that is produced for the psychedelic underground typically fetches from $100 to $200 per gram, ($50 to $100 per dose), clearly too expensive to become a popular street drug. Mescaline sulfate can be distinguished by the structure of its crystals. These are approximately 1/4" long and look like fine needles or shards of glass. The amount of mescaline needed for a high can fill two double 0 gelatin caps. Those who claim they've had mescaline in tiny microdot pills, or as a white powder in a capsule where only 1/8th of a gram produced a powerful experience, have been given something other than real mescaline. Another form of mescaline which I've never tried, mescaline hydrochloride, is said to be about 25% more potent than mescaline sulfate. The most readily available source of mescaline is trichocereus cacti which can be found in many large nurseries, particularly ones that deal exclusively in cacti and succulents. I tend to buy only from nurseries that mark their cacti with the botanical names, and try to avoid asking for psychoactive cacti by name. I was quite blown out when a redneck cacti wholesaler responded to my request for Trichocereus peruvianus with "That's supposed to be a high alkaloidal content cactus, I don't know if that's the reason you're looking for it." Another cacti wholesaler sold me an unmarked cactus claiming it to be T. peruvianus. It was psychoactive, but no more so than other trichocereus species I've tried. If the cacti sellers do not know people are buying their cacti for psychoactive purposes it is less likely to become an issue with the authorities. And since this magical plant is one of my favorite "legal" highs, I'd like to see it remain legal and available indefinitely. Trichocereus cacti are considered legal for ornamental purposes only. It is illegal to ingest, extract, or sell for psychoactive purposes: a fairly gray area of the law. Before going cactus shopping I've found it useful to look at pictures and read physical descriptions of these varieties. Many large libraries will have a selection of books on cacti and possibly lexicons. Most varieties of trichocereus are difficult to tell apart, and I've even seen conflicting information in the keys of lexicons. However, these books should at least give one an idea of which cacti to examine the name tags on. These cacti are also frequently available from various herb and plant dealers that cater to the underground. The amount of mescaline sulfate required for a full experience is about 500 mg. (or approximately 350 mg. of mescaline hydrochloride) Pure mescaline should be taken in two half-doses about 30 minutes apart. This will minimize disturbance of the stomach, which usually passes after the first couple hours of the high. When consuming whole cacti one is actually taking a combination of alkaloids which synergistically interact with each other, producing an experience which is different, and sometimes more desirable, than pure mescaline. The potency of Peyote, as well as different people's tolerance to it, seems to vary widely. Some people report powerful experiences from as few as three or four Peyote buttons. More often users consume 12 to 15 buttons, and eating more than two dozen is not unheard of. The amount of San Pedro one must consume to obtain the full effects is a piece approximately 10" long and 3" in diameter. Cactus is most potent when harvested during the hotter times of the year. Trichocereus cacti are relatively quick growing and easy to make cuttings of. Each plant may produce one or more highs worth per year. When harvesting these cacti the top four inches of growing tip can be cut off to be replanted. A length from beneath this can then be cut to consume. The remaining cactus stub will also continue to grow, frequently putting out several branches where it was cut off. The tip cutting should be laid on its side in the sun until the exposed flesh calluses. Once this has occurred, it should be placed upright in a half soil/half sand mixture with good drainage. When cutting the lower, consumable section of the cactus, care should be taken to cut at an angle, going upwards toward the middle of the plant. The fleshy part of the cactus will shrink in where it was cut, and if cut straight across it will form a bowl that will hold water and tend to mold. To prepare San Pedro for consumption I first cut out the spines, which is fairly easy to do on most trichocereus. The next step I take is to cut the skin off in "V" strips, cutting from the outside of each rib into the central section of the cactus. These "V" strips are saved as they contain the most potent flesh, although the skin itself is thick, waxy and not edible. The process of eating San Pedro is definitely not fun. It can be tolerated by most serious trippers, but it is difficult to consume enough cactus to get a powerful high. The taste of different trichocereus species ranges from very bitter to tasteless, the varieties with less taste tending to have a slimy consistency. With these varieties the texture is the main obstacle to consuming large quantities. I chew the cactus to a pulp and then wash it down with some liquid. It also helps to eat some full-grain bread as I'm doing this to soak up the liquid in my stomach. The dark green flesh next to the skin is the most potent part of the cactus and should be eaten first. I do this by flattening out the "V" strips and scraping the flesh off of the skin with my teeth. I then proceed to the central part of the cactus. This should be eaten around like corn on the cob. The flesh on the protruding ribs should be eaten first. The core is woody and not edible. The high begins coming on some 45 minutes after ingesting, and since it takes a while to consume the cactus, one may start feeling high while they are still eating. The psychoactive alkaloids can also be extracted using water or alcohol. To extract in water one needs to mash the cactus and boil for several hours. One friend reports excellent results by boiling just the skin with 3/8" of flesh attached to it, evaporating off all the liquid at about 140 degrees F, and then powderizing the resulting residue and packing it in gelatin capsules. Peyote is even more difficult to eat than San Pedro as the taste is extremely bitter. Some people find that by accepting the flavor and not cringing from it they are able to get past any aversion to eating it. One friend even told me that dried Peyote took on the flavor and consistency of good chocolate. However, those like myself who find the taste intolerable can pulverize the dried buttons and pack them into gelatin capsules. The mescaline experience is my favorite of the traditional psychedelics (LSD, psilocybin, mescaline). I find it has the advantages of acid: a lucid, penetrating, focused ability of the mind, rather than the more dreamy, drifting state I get from mushrooms. However, I feel totally relaxed with mescaline, even calmer than I feel on mushrooms, and there's no trace of the metallic edge usually felt on acid. Eating whole cactus produces a more body-oriented high than pure mescaline. San Pedro usually produces a very smooth, flowing experience. However, the effects of Peyote are quite different due to its unique mixture of alkaloids. With Peyote, the first couple hours of the experience are very dream-like, drifting, almost a delirium type state. During this time I feel groggy and sleepy and can do little more than lay back and sink into the feeling, which is not unpleasant. Some element of Peyote also acts as an emetic, making most people nauseous about two hours into the trip. I find the mescaline experience to be more visual than mushrooms or acid. However, I've only experienced really spectacular visuals when using synthetic mescaline. My high tolerance to most psychedelics, along with the capacity of my stomach, has prevented me from ever being as high as I would have liked when eating whole cactus. Like psilocybin, mescaline tends to link me with collective evolutionary consciousness more than synthetics like LSD. The experiences produced by these natural psychedelics seem more "significant" than an acid high, which is more analytical. An acid high often seems to be a by-product of magnifying the mind, whereas with mushrooms and cactus one feels they are in touch with something ancient, spiritual, and personal. Mescaline has a unique signature in this context which I find most magical, a feeling that the Gods or protective allies are smiling down on me. The duration can be 6 to 14 hours depending on the amount consumed. The "coming back" portion of a mescaline trip is smoother than with the other traditional psychedelics. And I've never felt the "drained of energy" or "neural overload" feeling that can come after an intense acid trip. This allows for a more conscious and therapeutic return to regular consciousness, after which I can easily sink into sleep and wake up feeling refreshed. Some aspects of the mescaline high are quite distinct from LSD or mushrooms. The visions produced by mescaline have a different character and structure. When being overtaken by a full strength mescaline trip, I've felt more than with any traditional psychedelic that I was an extraterrestrial being, immersing myself in new sensory phenomena for the first time. Where LSD or psilocybin heighten and clarify the sense of hearing, mescaline produces auditory hallucinations, heightening the hearing sense but also causing sounds to be quite different than normal. Mescaline also sharpens the olfactory sense to a much finer degree than LSD or psilocybin. I've particularly noted this in my ability to perceive the smells of numerous different plants when using synthetic mescaline outdoors. As for aphrodisiacal use of mescaline, wow!, it brought energies out of me that I never knew I had. At the conclusion of this chapter is one of my favorite descriptions of a psychedelic experience. It illustrates the depth and spiritual significance that a mescaline experience can produce. This is a description of a Peyote experience which Bernard Roseman undertook with members of the Native American Church in the late l950s. It was published in The Peyote Story, Wilshire Book Company, 1963.